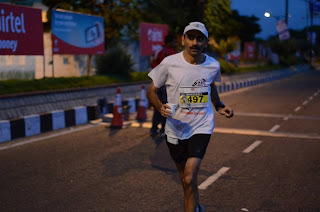 Failing to conquer the hilly course of my first Full marathon of the season I missed the aggressive target I had set for Airtel Hyderabad Marathon by over 10 minutes. While the first half was pretty much as per plan I lost so much pace in the second half that I failed to even finish in sub 3:40. Somewhere between 27Km and 37Km I lost it both physically and mentally and was disappointed with the race; Though it was my best time on this course beating my time in Airtel Hyderabad marathon 2011 by over 5 minutes and my third best time ever after MHRM in October 2012 and SCMM in January 2013. And I ended up coming first in the Senior or super veteran age category - this being my first race after graduating to that age group. As usual I reached Hyderabad on Friday,23rd August evening. 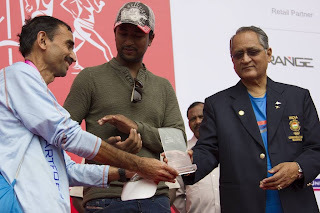 This time I went for the Bib pickup on Saturday afternoon around 3:30 PM instead of the morning and decided to stay Saturday night with other runners at Nizam club(rather than at the in-laws place in Domalguda). The expo at Hitex exhibition hall was spacious and well organised - though the location itself was quite out of the way and not easily accessible. At the expo I met Ashish Shah of Zendurance - which organises niche endurance events. 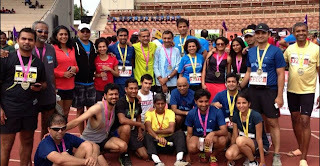 Jugy and I joined Partha(with whom I was room-ming) and other runners at Nizam club around 6 PM. The room there was clean and comfortable. While most other runners decided to walk up to the start point about 1.5 Kms away I relaxed in the room after pinning up my racing bib and laying out all the accessories for the race - shoes, socks,cap, towel, Garmin etc. Between 8 and 9 PM we had a relaxing dinner of Rava idlis and curd rice at a Kamat restaurant few hundred meters away. I went to bed at 9:45 PM and dozed off quite quickly. As usual I woke up a few minutes before my alarm was to go at 3:35 AM. After 2 bananas and some almonds and walnuts I was out of the room by 4:15 AM. Naresh, Ravi and I took a brisk walk to the starting point at People's Plaza and were there by 4:35 or so. After unloading my bladder in the open(the queue for the port-a-potty was too long) and some warming up I checked in my bag and headed to the start line around 4:50am bumping into numerous familiar runners along the way. At 5:01 AM, as per my Garmin, we were on our way. I ran mostly alone and was not able to get into a good rhythm. Due to early morning rains the humidity seemed to be a bit high. Runners like Siddesha and Neera were a few meters ahead. There was a small stretch of about 500m around the lake where it was compeltely dark and the road was uneven. Fortunately there was no mis-step. I reached the 10Km mark after the Khairatabad(1st) flyover on target in about 49 minutes. Just before entering the Panjagutta (2nd) flyover I went past Pankaj Rai. Lost bit of pace in the climb in Banjara Hills - I realised I was not able to completely make up for the lost time in the downhill stretches. Nevertheless, I got to the 21K mark in a little over 1:45 at an average pace of 5 mins/Km. However after the Gachibowli (3rd) flyover the pace started to drop. I started getting light cramps in both my hamstrings due to which I was unable to push myself. Somehow in this part of the race I was not as mentally strong as I have been in the recent past. And the average pace began to steadily climb. 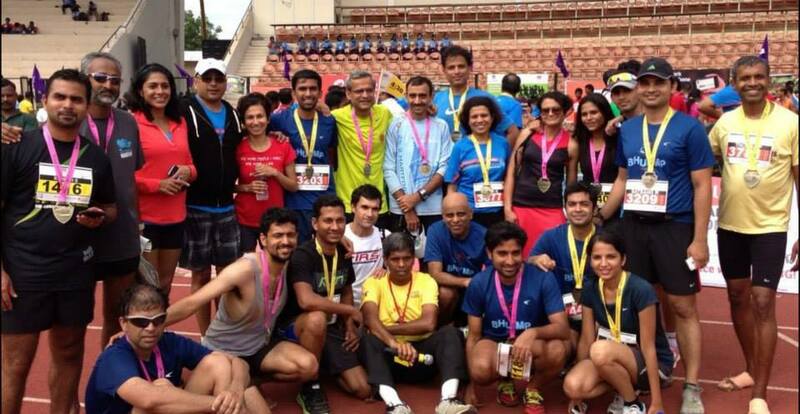 By the 31Km mark I knew that sub 3:35 was not achievable - even sub 3:40 started to look challenging. My goal was to hit 34K between 2:50 and 2:53- it was 2:57+ when I got there. Now the hamstrings cramps got worse. I stopped at the medical station at around the 35Km marked and sprayed them generously with volini. I repeated the same around the 38K mark inside the Hyderabad university campus. At this point I found even the slightest of gradients quite challenging to negotiate. Though the goal was to keep the pace as close to 5:30 as possible in the last 8Kms my pace varied between 5:05 to 6:23! I felt a bit better in the last 2 Kms and should have pushed a bit harder to stay sub 3:45. Around the 40Km marke Neera went past me - she also seemed to be struggling a bit. But the stretch inside the stadium seemed to go on forever and though I sprinted the last couple of hundred meters on the tracks I crossed the finish line in a net time of 3:46:20 a minute or so behind Neera and Siddesha. I was tired and a bit down mentally but not completely exhausted. My training had been quite ok - I probably over trained a bit. Maybe the slight cold and sore throat was a factor or the fact that BAA had responded that the Hyderabad marathon course was not recognised for BQ time was playing on my mind. It maybe a combination of this but the bottom line probably is that I am not cut out for hill running!! 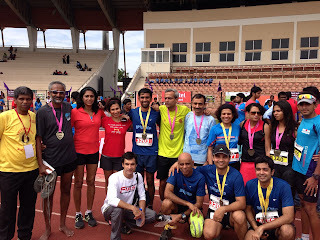 I hung around with other runners from Bangalore for a bit. The snack box was ok - though lot of runners seemed to have thought it was not good. This time I watched out for the award ceremony and collected the age category winner plaque. I was back at Nizam club by about 11:30 AM and Domalguda by 12:30 PM. Overall the race was well organised. The traffic control and volunteer support in the village stretch between 26K and 30K could have been better. Asking finishers to climb up the steps to collect the snack box did not seem right. A sore throat and running nose(had slight symptoms of these before the race) from the evening of the race dampened my recovery from the race. Did just one 4Km run the week after the race. This week went back up to 32Km over 3 easy runs . 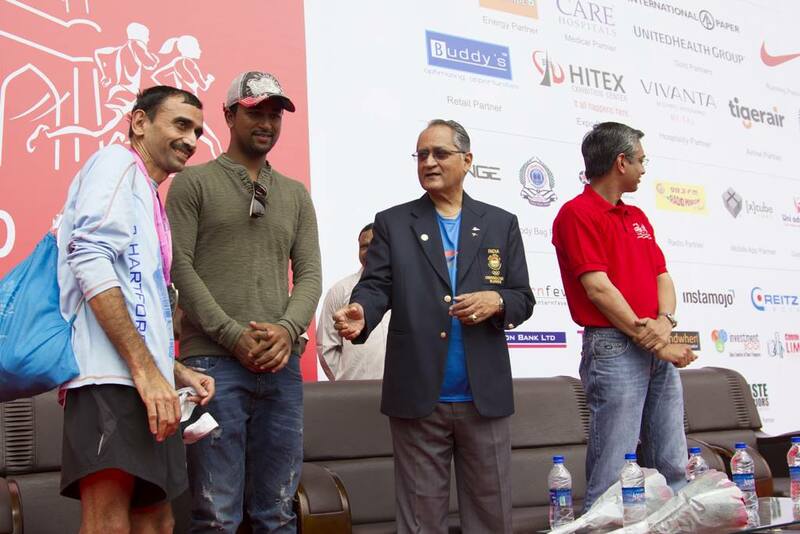 I will be taking September easy before starting training for SCMM 2014 from 30th September.